Hey, hey, hey! It's Devo here, though Dad also calls me Diva, Devo Wevo or Lil Girly. 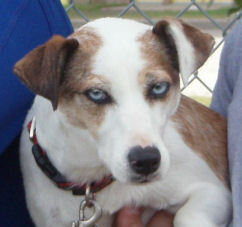 I am a border collie X Jack Russell mix (aka borderjack), and I was born on December 1, 2002 in Virginia. I live in Langley with my humans Mike, Jennifer, Ryan and Erin, and my canine siblings Brodie, Tone, Jagger and my daughter Posh. My humans were hooked on flyball with their first and second dogs, so by the time I arrived on the scene, it was natural that I would follow in their footsteps. My biggest training success has been my box turn; biggest challenge has been running in the pack. I was in a collision when I was young, so I can be a bit finicky about who I like to pass. I started playing the game in December 2003 and I've been going strong ever since! My best time to date has been a 3.87, but I usually run around 4.2. Aside from flyball, I really enjoy putting my terrier tenacity to work hunting mice and rats. I am also working on a grand scheme to move myself up higher in the pack order in the house. My favourite tricks are acting paralyzed, and turning off Dad's chest. My favourite toy is the ball, but failing that, a piece of wood will suffice. And the best place in the house - anywhere near my dad - beside the bed, near his feet, or on his lap. Yep, I'll admit it, I'm a Daddy's Girl.